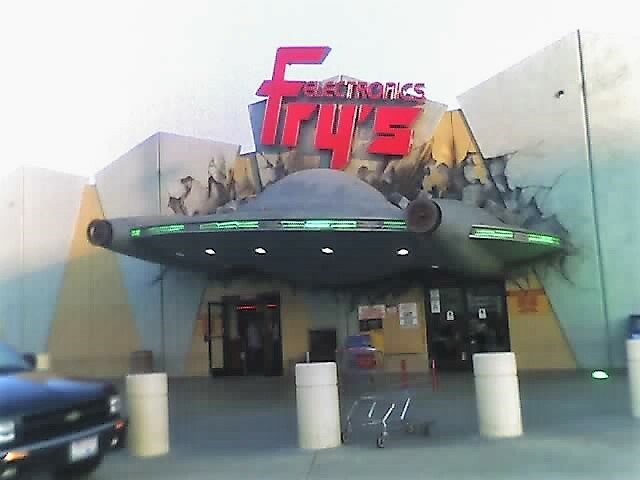 Fry's Electronics is a chain of warehouse-sized stores where you can buy everything from appliances to stereos to cameras to computers to software, music, movies, and more. The fun thing about the stores (besides their big selection and and good prices) is that each one is decorated in a different theme (for example, an Amazon rain forest). For science-fiction fans, the Fry's store in Burbank, at the corner of Hollywood Way and Valhalla Blvd, near the Bob Hope Airport, comes close to being a must-see tourist attraction, thanks to decorations that combine elements from such sci-fi classics as MARS ATTACKS, DAY THE EARTH STOOD STILL, THEM, IT CAME FROM BENEATH THE SEA, STAR WARS, INDEPENDENCE DAY, and GODZILLA VS. MOTHRA. Things get off to a promising start with the sight of a flying saucer embedded above the entrance, as if it has literally crash-landed only moments before. Inside, customers do not seem particularly disturbed by the alien invasion taking place over their heads. The aliens, with their green skin and big-brained heads encased in glass bubbles, resemble the Mad Martians from MARS ATTACKS (although the look is somewhat generic, perhaps inspired by the bubble gum cards on which the movie was based). There are also some wax dummy army guys fighting off the invaders, but they seem not to be successful: most seem to be writhing in contortions as if being zapped by heat rays that are melting their rifles and jeeps. 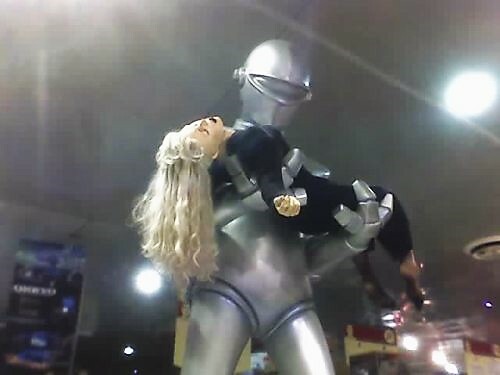 A replica of Gort, the robot from DAY THE EARTH STOOD STILL makes off with a damsel in distress. Although it's hard to distinguish in this photograph, the surface above and behind him is actually the exterior of yet another flying saucer. 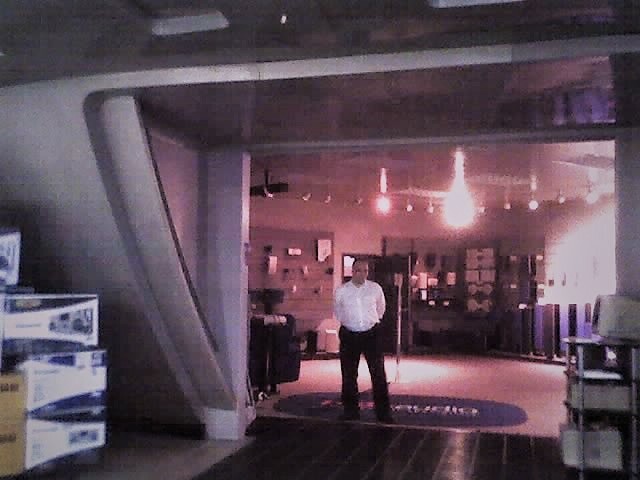 This flying saucer, much larger than the saucer embedded in the exterior wall, houses much of the home entertainment electronics. After listening to some astounding sounds, you can walk out looking dazed, just like those abducted guys at the end of CLOSE ENCOUNTERS OF THE THIRD KIND. One highlight is the section devoted to photographic equipment: small, portable still and video cameras. 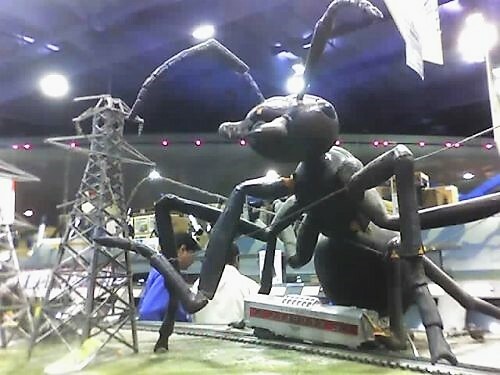 Unlike the rest of the store, which features life-sized monstrosities, this one is laid out like a miniature train set, complete with "giant" ants (as in THEM, seen above), a "giant" octopus (as in IT CAME FROM BENEATH THE SEA), flying saucers blasting away with neon laser beams, and an Earth-made rocket ship like the one in WHEN WORLDS COLLIDE (see more in the gallery below). 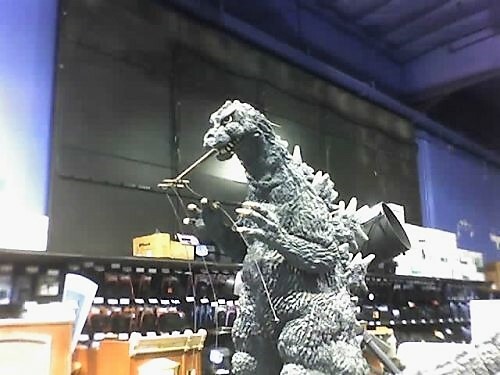 Even Godzilla gets into the act, destroying a miniature building with a "Fry's" sign on it. (For you Godzilla-geeks out there, the design is circa GODZILLA VS. MOTRHA). A nice fringe benefit of the display is that it allows you to check out the cameras on sale by framing shots of the miniature destruction. The store is so much fun that you might want to visit even if you're not interested in buying any electronics. 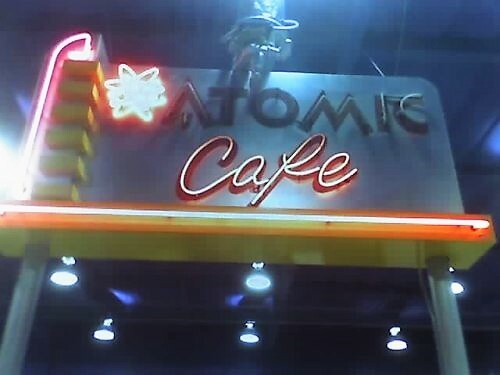 In fact, if you just want to hang out, there is a small eatery called the Atomic Cafe, which is situated to resemble a drive-in movie theatre from the 1950s. The "seats" and "tables" are actually hollowed out cars from that time period, and a screen above the grill (surrounded by bubble-head Martians, along with one of the ugly aliens from INDEPENDENCE DAY) projects videos of appropriate films, so you can sit back and enjoy CREATURE FROM THE BLACK LAGOON just like your parents (or grandparents) did, decades ago. The menu is limited, but what else would you really want to order in this setting besides a burger, fries, and a soda? If you do have money to burn, there are lots of ways to spend it. 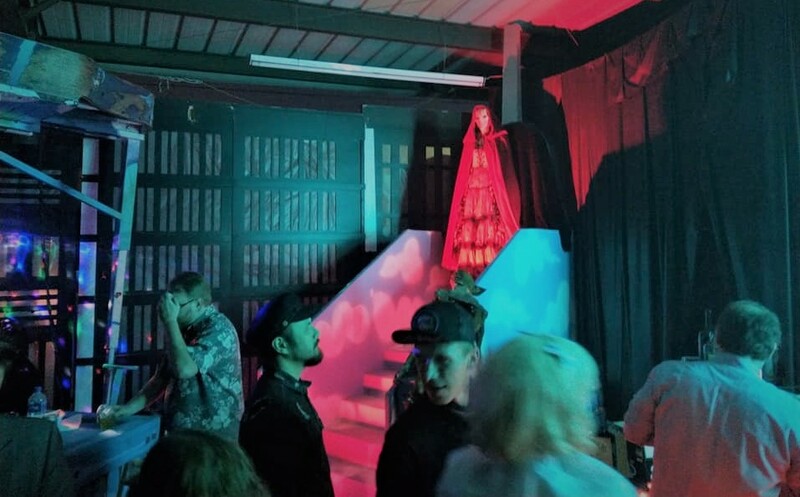 The store is so spacious that it has room for extensive selection of DVDs, including box sets and sections devoted to horror, anime, and science-fiction. Outside of a specialty store, you are more likely to find obscure titles here than just about anywhere else. There are also bins filled with discount DVDs. You won't find many classics, but for a few bucks each (barely more than the price of a rental) you can purchase numerous old cult movies like WHITE ZOMBIE with Bela Lugosi and SVENGALI with John Barrymore. Of course, the place is also filled with the latest software, videogames, and electronic gadgets (need a solar cell to recharge your batteries -- you've come to the right place!). 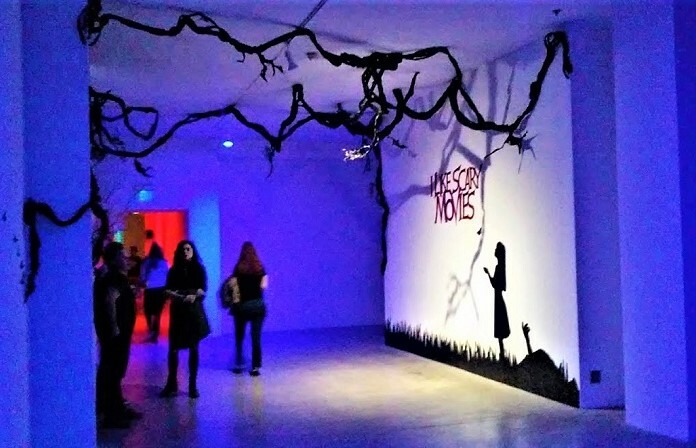 You'll want to take your time browsing the aisles and checking out the merchandise, because you never known what new monstrous menace may be lurking around the next corner. 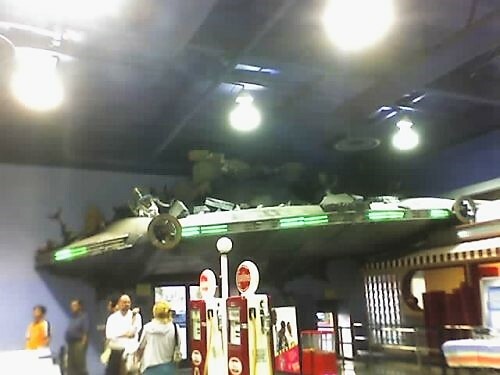 Fry's Electronics is located at 2311 N. Hollywood Way, Burbank, California. Call (818) 526-8100 for more info, or visit their website.